If you’re looking for a challenging but doable Single Type (or Monotype) Run in Pokémon let me suggest the Grass type. Unlike Ice, Dragon, and other difficult types, Grass Pokémon are (most of the time) available at the game’s beginning due to your starter. As such, you have a companion you can rely on for the entirety of your game regardless of team size or diversity. However, you will have to overcome difficult feats like low movepool and dual-type diversity and a large amount of weaknesses. These difficult feats make Grass a challenging but not impossible run to do. So which games are the best for a Grass type Run? Let’s find out. 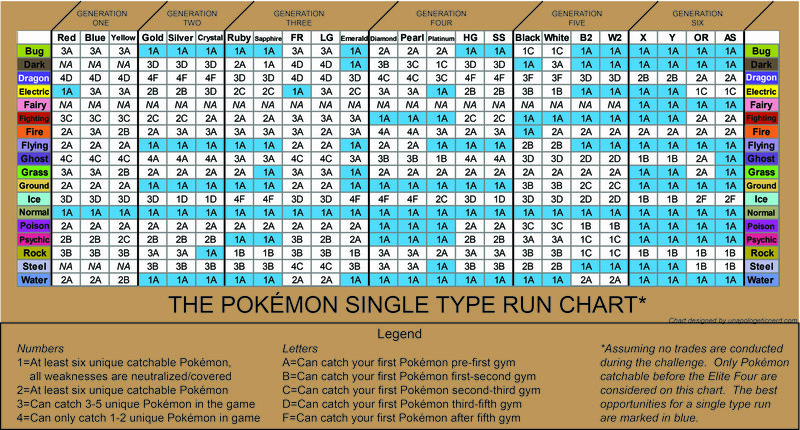 First off, the chart above shows most of the Pokémon games in the series so this will give you the quick and easy which games you should select for a Grass Type run. Basically, the good news is that most of the series’ games will give you a full team of Grass types with the trade off being not all of them will cover your weaknesses. But for you die hard fans I recommend looking at Pokémon Sapphire, Emerald, X, Y, and AlphaSapphire thanks primarily to this beautiful Pokémon right here. Yep, Ludicolo’s Grass/Water makes him a valuable Pokémon. I’ll go into Ludicolo later but for now understand that if you want a slick Grass type run, find a game that has this dancing Pokémon in it. If this doesn’t bother you, however, consider Ruby, Omega Ruby, and any of the Generation Sun/Moon games as they have reasonable diversity with some fun Pokémon. For those of you interested what some of these team rundowns may look like let me give you a sample. AlphaSapphire you have (Mega) Sceptile, Breloom, Ludicolo, Trevenant, Roserade, and Cradily. Cacturne, Whimsicott, and Tropius are other options. X and Y you have Chesnaught, (Mega) Venusaur, Ludicolo, Ferrothorn, Exeggutor, and Trevenant. Mow Rotom, Vileplume, Victreebel, Jumpluff, Gogoat, Simisage, and Roserade are other options. Sun and Moon have Decidueye, Whimsicott, Parasect, Exeggutor, Roserade, and Dhelmise. USUM additionally contains Cradily, Mow Rotom, and Tropius. So pretty fantastic overall but if given the choice I would choose XY as you have a lot of beautiful Pokémon working together. Your starter Chesnaught gives you a strong fighter and can learn Rock Slide to handle Bug Pokémon. Mega Venusaur’s Thick Fat ability neutralizes Fire and Ice weaknesses so if you don’t want Ludicolo and want say Jumpluff then your fine. Even then Ludicolo can learn Ice Beam which is rare among Grass types (and of course Surf takes care of your Fire Pokémon). Exeggutor and Trevenant learn some unique moves like Psychic and Shadow Moves which further aid your run. Finally, Ferrothorn rounds off our team by being the team’s wall and shutting down the like of Ice, Flying, and Poison types. If you’re really worried about Flying Pokémon then get a Mow Rotom and zap them down. These Pokémon (and more) are spread nicely throughout the game so you can add to your team with decent progression. The worst game in the franchise for a Grass type run is probably Pokémon Yellow, Bulbasaur is not a starter and you can get him only right before the second gym (at least in Pokémon Let’s Go you can get a Bulbasaur in Viridian Forest which is leagues better). Even then the Kanto games are not the best as your dealing with a less-than-full team with half of your team being Grass/Poison which is pretty bad considering Psychics reign supreme in those games. Duh! This is the Pokémon you’ll be hanging out with for all of the game! Doesn’t matter who, you’ll want to take your starter to the Elite Four as they all have great stats. Quite a few of them even have dual typing which further expands their moveset and can counter common weaknesses. Mega Sceptile neutralizes Fire moves (at the cost of 4x weakness to Ice) and Mega Venusaur neutralizes Fire and Ice moves. Torterra can learn Rock and Ground moves while Deceidueye gives you some sweet Ghost moves. Serperior has the rare Coil move which can make it a tank. Meganium is probably the worse out of the bunch but at least you can teach it Earthquake. As mentioned before, if you want to cover all your Grass’ weaknesses you’ll likely need this pineapple Pokémon. Although Ludicolo doesn’t have the best stats it makes up for its decent movepool selection. Besides its Water moves it can also learn Ice Beam, Zen Headbutt, and Focus Blast countering the likes of Flying, Poison, and Ice Types (along a host of other Pokémon). If you’re up for it, you can also run a Rain Dance set on it due to its rain abilities (and dampening Fire type’s super effectiveness). The dual Grass/Poison combo is the third most common dual type combo and is available in every game. This commonality means you are guaranteed to neutralize Bug and Poison moves. Unfortunately, a Grass/Poison Pokémon for a Grass team is kind of meh due to said abundance and a glaring weakness to Psychic moves. But a lot of these guys can learn Earthquake so it’s not all bad. Your other major counter against the birds will be Cradily who can actually learn Rock moves but here’s the catch, Cradily doesn’t naturally learn any decent Rock moves! You’ll have to use a TM like Rock Tomb or Rock Slide, bleh. But! At the same time it can learn TM Earthquake! This means you have a Pokémon you can use against the like of Fire Pokémon which is quite impressive. Cradily does suffer though from its horrendous speed, its lackluster ability, and hit-or-miss availability. By itself, Exeggutor is a fine Pokemon but the real star is its Alolan form. Alolan Exeggutor boosts the move diversity to a respectable degree. It’s one of the few Grass types that can learn Flamethrower, which is baller, and it can learn Dragon Hammer which is very rare and can only be learned from A. Exeggutor and Tropius (via breeding). The Dragon typing it not bad either as it neutralizes the Fire Weakness (but watch out for Ice!). This neutrality to Fire means you can teach A. Exeggutor Earthquake and go to town against hot opponents. Also, why wouldn’t you train one? They’re hilarious! There’s one more Grass Pokémon that resists Flying moves and it’s one I’m sure you may have forgotten! In its base form, Rotom is Ghost/Electric but after Generation 5, its forms change it to different types. 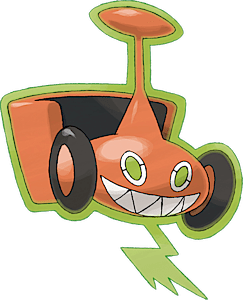 Mow Rotom thus is the only Grass/Electric type out there and it’s strange. You got Levitate, some weird resistances here and there, but most importantly you got Thunderbolt. It’s very rare for a Grass Pokemon to learn an Electric move which is why Mow Rotom deserves to be on this list. Additionally, the form Rotoms are much stronger than regular Rotom and you get a Pokémon with great Defense, Sp. Attack, and Sp. Defense. Now, it’s going to be a pain to get this Rotom but if you love this Pokémon, then it will be worth it! This entry was posted in Pokemon, Pokemon Single Type Run, Video Games and tagged Chesnaught, Cradily, Ferrothorn, Grass Pokemon, Grass Type, Ludicolo, Monotype Run, Mow Rotom, Nintendo, Pokemon, pokemon moon, Pokemon ORAS, pokemon sun, Pokemon USUM, Pokemon X, Pokemon XY, Pokemon Y, Rotom, Sceptile, Single Type Run, Venusaur, video games on January 4, 2019 by Andy.